If you've not been over to THE PRESIDENT'S INTERN BLOGSPOT you're missing out on some of the funniest stuff on the internet! Here's something interesting about one of the leading Republican presidential candidates. As you might have heard, Gov. 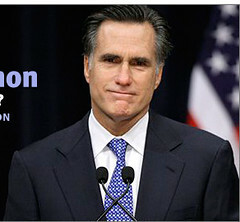 Romney is a Mormon. When he was in college in Utah, he had the lead part in the all-Mormon musical production of "Seven Brides for Two Brothers." Look closely at this photo, folks. He'll probably be John McSame's running mate. I must admit a little bias on this point, but my favorite children's book author of all time is Lynne Cheney. So when Mrs. Cheney told me months ago that she was working on a new book that was coming out this Christmas, I was very excited. The book is called My dog, Mohammed. It's the story of a little Muslim girl who goes looking for chocolate and ends up lost in a blizzard in the Swiss Alps. She is saved by a Saint Bernard who she calls Mohammed because she is so grateful for being saved. The story is meant to show Christian children that Muslim children are just like them. Everyone loves chocolate; anyone can get lost in a Swiss blizzard. However, it turns out that Muslim folk don't take the naming of lovable objects (Teddy bears) and lovable pets with Mohammed as a compliment. Some poor lady in Sudan is looking at 40 lashes with a whip. So Mrs. Cheney is currently in hiding in Idaho waiting for her publisher to burn all the copies of her book. I've heard that she is re-working the story for next Christmas. It's now called My dog, Reagan. It's about a child of a Democrat who gets lost in a blizzard in Massachusetts and is saved by a Republican pit bull. The Secret Service says that it should be safe for Mrs. Cheney to reappear in public by mid-2009.